Often times bulbs that remain in a fixture for a year or two become hard to remove. Once they finally burn out and need to be replaced they can be hard to grip and almost impossible to turn. Eliminate “frozen” sockets and the potential of broken bulbs. Bulb EZ is a non-toxic lubricant that will make installing and removing any type of bulb an ease. Remove hard to reach bulbs in a pinch and never worry about broken bulbs and exposed filaments again! Bulb EZ has a silky texture and is easy to apply. Use on incandescent, halogen, CFL, fluorescent tubes, and LED bulbs to ensure smooth installation and removal. Bulb EZ is a superior solution to silicone-based products that can dry out and cause even more problems. 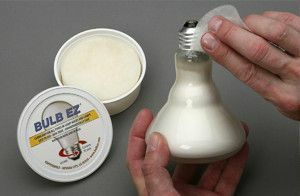 The Bulb EZ is a unique formula that will keep a bulb lubricated for years to come. Simply wipe the product onto the threads before install and you are ready to go! just a small amount of Bulb EZ will reduce the headaches of hard to reach bulbs and eliminate the dangers of broken bulbs throughout your home. For more information, please stop into our electrical department or visit the Bulb EZ website.